Mr. Lyons' practice is limited to the pursuit of motor vehicle accident, premises liability, wrongful death, medical malpractice, product liability and other catastrophic personal injury matters. 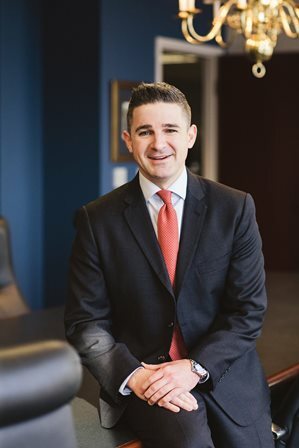 With nearly a decade of civil litigation experience, Mr. Lyons manages virtually all aspects of pre-trial litigation, including pleadings, depositions, discovery, motion practice, creation of exhibits, and trial preparation. Mr. Lyons is a graduate of The College of The Holy Cross, and Syracuse University College of Law. While in law school, he was a member and managing editor of the Syracuse Science and Technology Reporter. For his work in the field of plaintiff's personal injury litigation, Mr. Lyons has been named to the Upstate New York Super Lawyers® Rising Stars list since 2016. Prior to joining Bottar Law, PLLC, Mr. Lyons was an extern with the Office of Corporation Counsel, City of Syracuse. Mr. Lyons was born and raised in Briarcliff Manor, New York, and presently resides in downtown Syracuse.